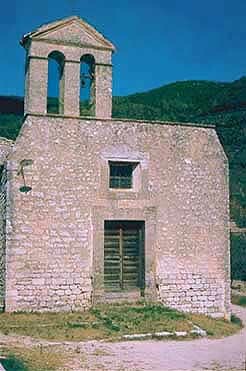 We have here a former parish church, as is shown by the placename La Cura that it gave to the surrounding area. It is now almost completely smothered in the successive extensions of the cemetery; yet it dominates the rocky spur that overhangs the village and seen from the valley below, it is still quite beautiful. Like many churches of the same period, it is strictly oriented: its apse points due east. The façade was ostentatiously reworked in 1630 and 1769. 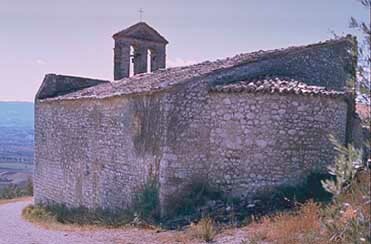 The south wall and apse before the cemetery was enlarged.. The interior is provided with three large polycentric arches that support the roof. The walls preserve remains of mediocre frescoes of the late 16th century: the Adoration of the Magi bears the date 1575. (Nessi). In 1571 S. Bernardino became the parish church when the older churches of S. Maria, S.Michele Arcangelo, S. Giovanni and S. Marco were merged into a single parish.